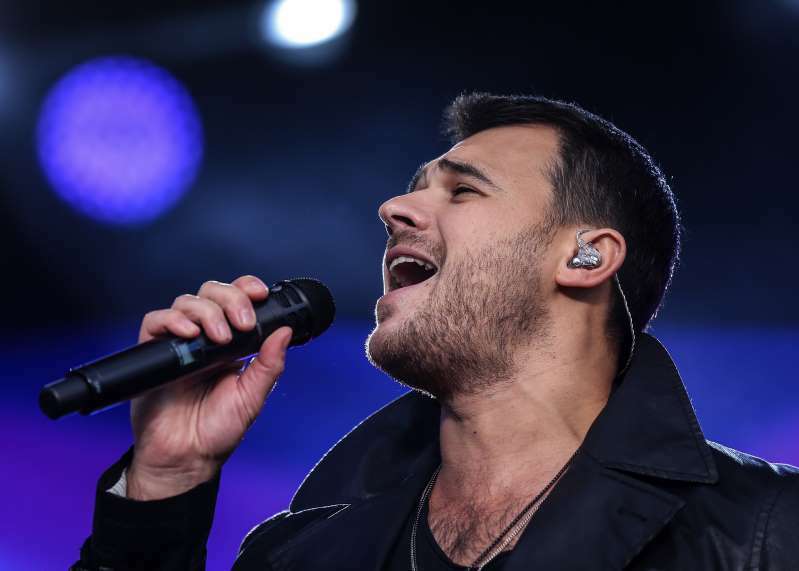 Singer Emin Agalarov performs in a concert in Red Square celebrating the Day of Russia. Emin Agalarov, a Russian real estate developer and pop singer who helped set up Donald Trump Jr.'s infamous 2016 Trump Tower meeting, spoke for the first time about allegations of collusion between the Trump campaign and Russians trying to influence the election. [post_ads]In an interview with Vice News that airs Tuesday (7:30 p.m. EDT on HBO), Agalarov dismissed the idea that he took part in meddling in the American presidential election as "ridiculous" and denied sending prostitutes to Donald Trump's hotel room during a 2013 trip to Moscow. "I have been accused of influencing — this is gonna sound very strange — influencing the American election. Me, this guy here from Azerbaijan, living in Moscow. Because I know personally Mr. Donald Trump," Agalarov told Vice. "It’s quite a strange and ridiculous accusation." Agalarov admitted to Vice that he helped set up the June 9, 2016, meeting at Trump Tower in Manhattan between Trump Jr. and Natalia Veselnitskaya, a Russian lawyer with Kremlin ties. President Donald Trump's son in law Jared Kushner and then Trump-campaign manager Paul Manafort also attended the meeting. Agalarov denied knowing Veselnitskaya. He said his father was acquainted with her and that he helped set up the Trump Tower meeting at his father's request. "I think somebody asked him to help her set that meeting knowing that we were acquainted with the Trump family," Agalarov told Vice. He said he did not know who asked his father to arrange the meeting. The Russian musician did say he spoke to Trump Jr. before the meeting. Agalarov said he told Trump Jr., "There's some people that want to meet you." "They obviously want something that could potentially help them resolve things that you could be interested in or maybe not," Agalarov said he told Trump Jr. "If you can spare a few minutes of your time, I'd be grateful. If not, no problem." According to Agalarov, Trump Jr. said, "Of course. I'll do it if you're asking." As for the email from publicist Rob Goldstone to Trump Jr. that said Veselnitskaya would have "dirt" on Hillary Clinton, Agalarov said Goldstone was exaggerating to gain favour with the Trumps. Agalarov also addressed an account from former Trump bodyguard Keith Schiller about a man who offered to send five prostitutes to Trump's room during a 2013 trip to Moscow for the Miss Universe pageant. According to The Washington Post, Schiller testified to the House Intelligence Committee in November that a man who appeared Russian or Ukranian made the offer at the end of a meeting with about 15 people to discuss the pageant. "No, man, we're not interested," Schiller told the man. He also said he and Trump later joked about the offer. Agalarov denied making the offer or knowing anything about it. "Mr. Trump came to Moscow with 87 of the most beautiful ladies in the world," Agalarov told Vice. "I would never even offer it because I can never live up to the high level of the most amazing and beautiful women surrounding us constantly." Algaraov released a video last month for his song "Got Me Good" in which he mocked the scandal around him, Trump and the 2016 election.